One of the weaknesses I’ve acquired over the last couple of years is for vintage flour sacking. Part of the reason for this new found love has a lot to do with inheriting quilt tops and blocks from my grandmother. Grannie’s 9-Patch is a work-in-progress, currently on my machine being quilted. Grannie’s Trunk Quilt was finished earlier this year and returned to my mom, who now lives with my dad in her mother’s, my grandmother’s, house. I’ve been acquiring more flour sacking in bits and pieces and I think I will eventually create a sampler quilt using these fabrics. 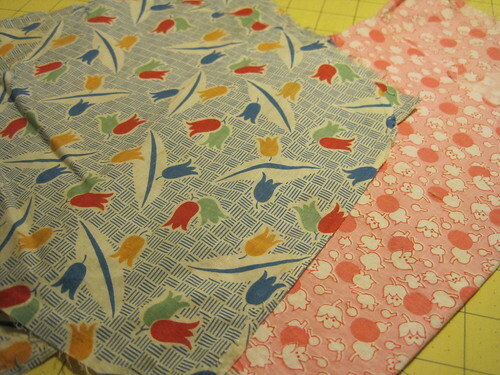 It’s something I’ve had on my mind to do for quite some time and I can’t think of a more appropriate fabric choice! This entry was posted in fabric friday, hand crafts and tagged fabric friday, flour sacking, vintage fabric on December 17, 2010 by Jennifer Ofenstein.